Mary Frances Jennings was born on 23 September 1892 at Cambridge, Middlesex County, Massachusetts.1 She was the daughter of Michael Edmond Jennings and Ellen Frances McGovern. Mary Frances Jennings was listed as the daughter of Michael Edmond Jennings on the 1910 census on 18 April 1910 at 27 School Street, Waltham, Middlesex County, Massachusetts.3 As of 29 November 1911,her married name was Mary Frances Mary Glennon. 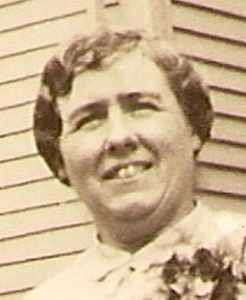 Mary Frances Jennings married Joseph Henry Glennon, son of Daniel Glennon and Catherine Gilman, 29 November 1911 at Saint Mary's Catholic Church, 133 School Street, Waltham, Middlesex County, Massachusetts. [S21] Social Security Death Index for Mary (Jennings) Glennon, online SSN# 017-28-2726.